For those who don't get on Twitter, following are the "tweets" sent by AMAZINGWORD. These are some quick thoughts about symbols in the Bible's numbers with some links to go with them. For more on number definitions see the basic numbers pages (1-10) and compound numbers (11 and up). #bible #theology #17 - 1017th chapter (resurrection chapter) John 20:17 "Jesus said...Stop clinging to Me for I have not yet ascended..."
Bible Numbers #22-Jesus-Num 22:22 ..the angel of the LORD took his stand... he was riding on his donkey and his two servants were with him. Perfect #bible - don't limit what you think God can do. When you realize what history says and then what the facts say...it will change you! Perfect #bible A impossible assertion history says can't be-God likes doing the impossible-Jer 32:27 God..is anything too difficult for Me? Perfect #bible - much evidence, but each can be dismissed as coincidence...ponder this one...Ps 117 exact middle and shortest chapter? How? #prophecy 1260 days-1Cor 11:26 For as often as you eat this bread and drink the cup, you proclaim the Lord's death until He comes--ver ref? #prophecy Dan 12:6 ...one said to the man dressed in linen..."How long until the end...?" - v7 1260 days-times-time+1/2 time - ver ref 126? #prophecy Rev 12:6 ..the woman fled into the wilderness...there she will be nourished for 1260 days - Verse reference of 126 a coincidence? #bible number symbolism - #23 Ex 23:23 My angel goes before you Jer 23:23 "Am I a God who is near,"... 1Samuel 23:23 ..I will go with you. #bible number symbolism - #23 - Matt 18:20 "where two or three have gathered together in My name, I am there in their midst." #Bible number symbolism - #23 God with us; The 23rd Psalm - The Lord is my shepherd; Matthew 1:23 his name is IMMANUEL means - "GOD WITH US"
Bible numbers- there are 41 verse 41s...interesting! I think the Bible code is probably real. If so, I'm pretty sure book, chapter, verse and many other numbers are part of the code as well. "Like Referenced Verses have a thread of common theme... http://bit.ly/8WqtiI http://is.gd/2vt70"
"Bible's Symbolism for #23 = God With Us -- being brought together http://bit.ly/3BAh9k http://is.gd/2vt70"
Bible not true? 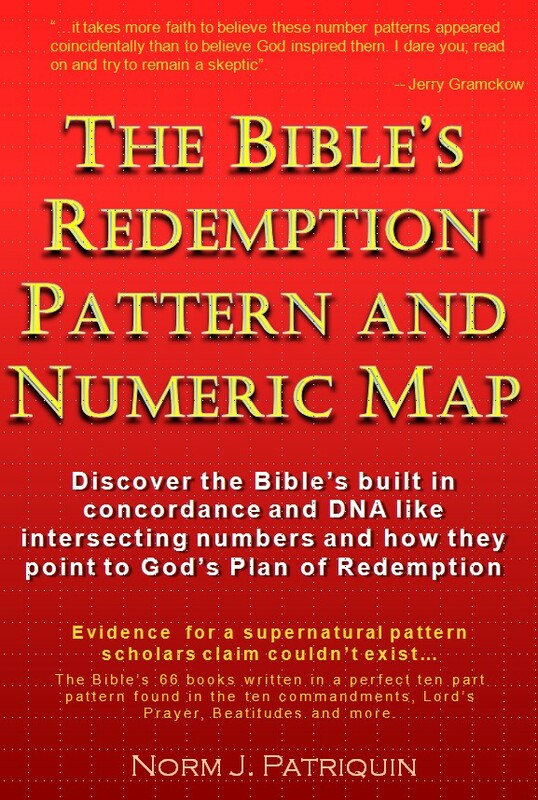 Biblical structure suggests DNA like perfection in Bible--Exact middle chapter the shortest w just 2 verses PS 117? @comingofchrist Matt 24:42 is 24000th verse re Day of the Lord-999th ver is of rapture-Mt 24:41 one will be taken and one will be left.